Imagery Analyst integrates computer system into their line of work and organizes the work closely, these analysts employ different strategies to plan and converse with various other specialists of this field. The chief responsibilities that are attached to this job are to perform spatial analysis, draft detail reports, create effective charts, maps or any other image based on their observation. Imagery Analyst has to use their strong communication and interactive skills and lead the organization as a team to meet its objectives. They should be able to work under minimal supervision and have the proficiency to use the needed software to facilitate their given work. 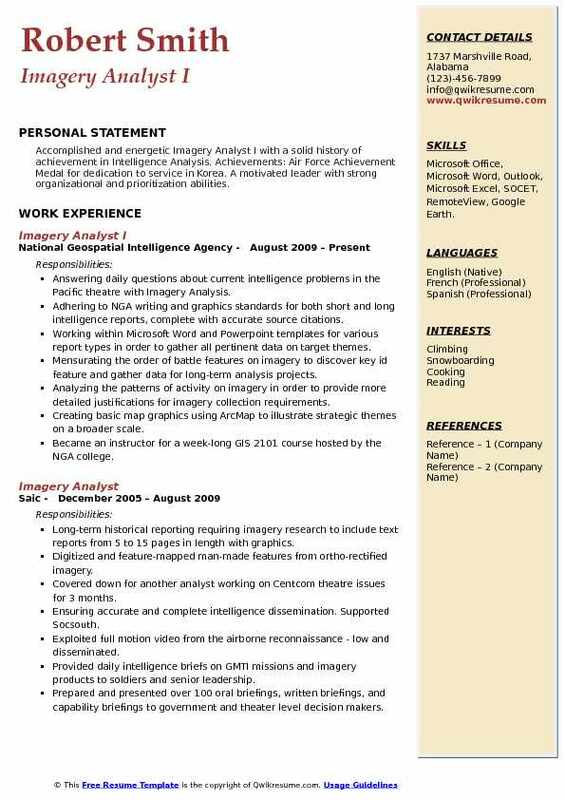 Imagery Analyst Resume Sample which depicts candidate with excellent decision making skill to solve and manage image processing applications can make a shining career as an Imagery Analyst. 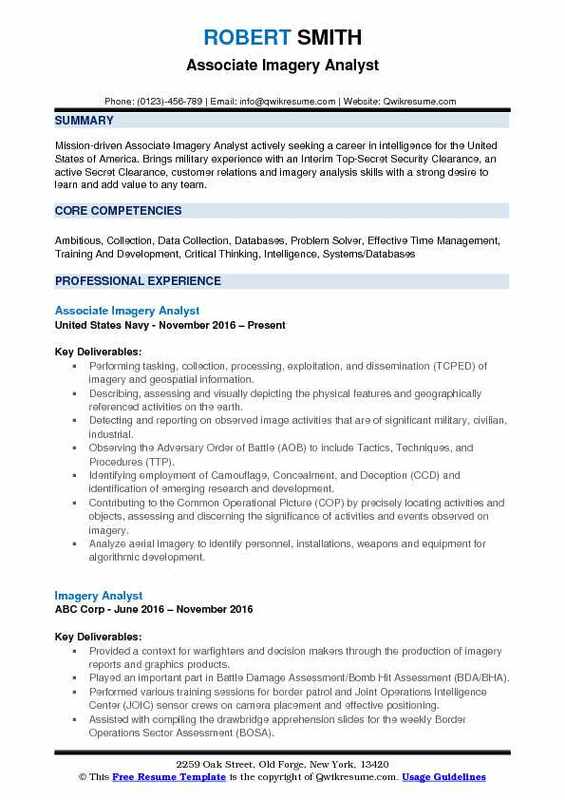 A Bachelors degree in Imagery analysis or Computer Science or IT or its related field is mandatory for this job post; however, a degree holder with imagery certification gets an added advantage. 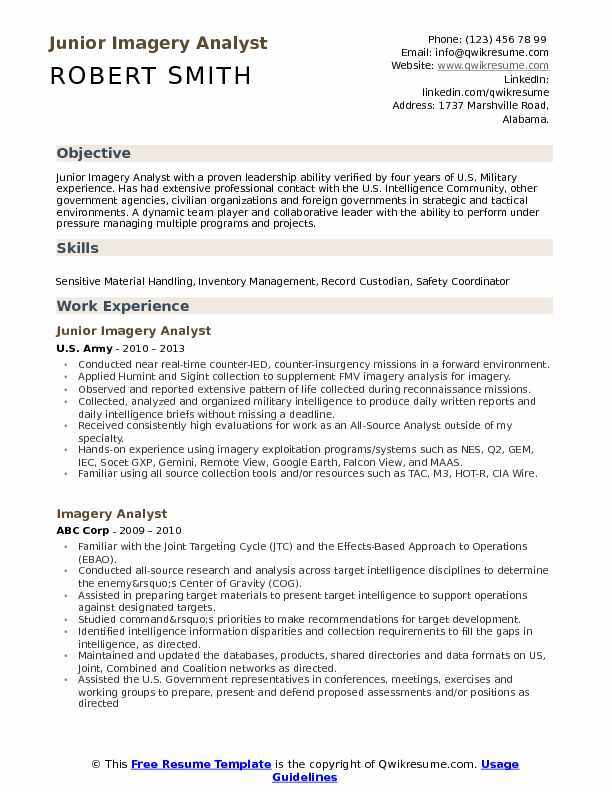 Objective : Junior Imagery Analyst with a proven leadership ability verified by four years of U.S. Military experience. Has had extensive professional contact with the U.S. Intelligence Community, other government agencies, civilian organizations and foreign governments in strategic and tactical environments. A dynamic team player and collaborative leader with the ability to perform under pressure managing multiple programs and projects. Conducted near real-time counter-IED, counter-insurgency missions in a forward environment. Applied Humint and Sigint collection to supplement FMV imagery analysis for imagery. Observed and reported extensive pattern of life collected during reconnaissance missions. Collected, analyzed and organized military intelligence to produce daily written reports and daily intelligence briefs without missing a deadline. Received consistently high evaluations for work as an All-Source Analyst outside of my specialty. Hands-on experience using imagery exploitation programs/systems such as NES, Q2, GEM, IEC, Socet GXP, Gemini, Remote View, Google Earth, Falcon View, and MAAS. Familiar using all source collection tools and/or resources such as TAC, M3, HOT-R, CIA Wire. Primary operator of global broadcasting service supporting USAREUR training exercises. Utilized maps, aerial imagery and intelligence data for use in intelligence products. Coordinated as a Mission Manager with team members, ISR assets, and customers. 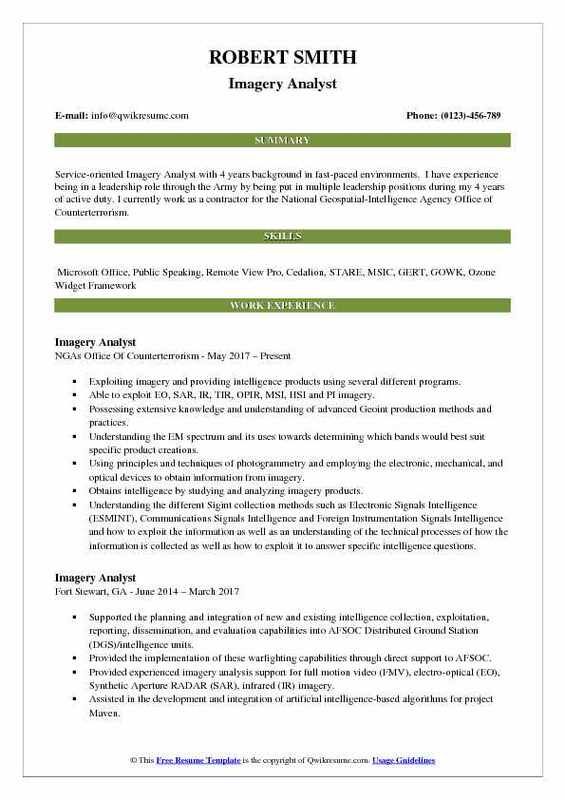 Objective : Mission-driven Associate Imagery Analyst actively seeking a career in intelligence for the United States of America. 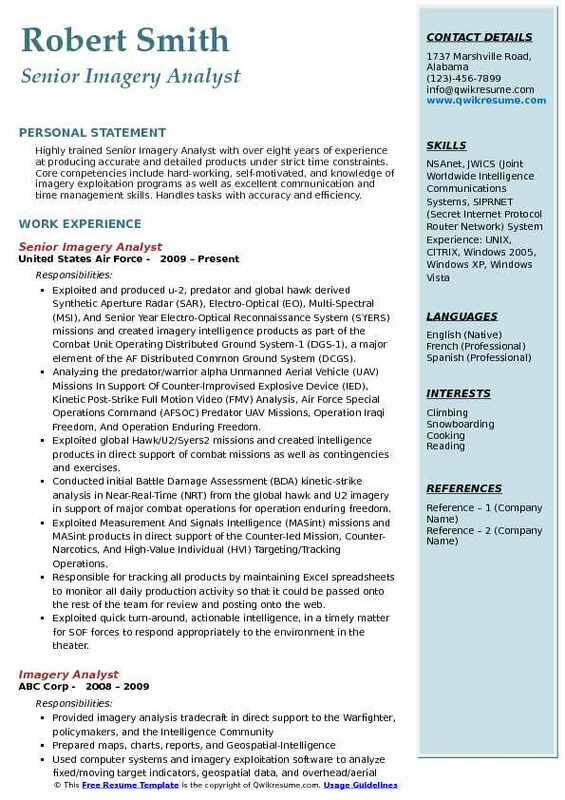 Brings military experience with an Interim Top-Secret Security Clearance, an active Secret Clearance, customer relations and imagery analysis skills with a strong desire to learn and add value to any team. Performing tasking, collection, processing, exploitation, and dissemination (TCPED) of imagery and geospatial information. Describing, assessing and visually depicting the physical features and geographically referenced activities on the earth. Detecting and reporting on observed image activities that are of significant military, civilian, industrial. Observing the Adversary Order of Battle (AOB) to include Tactics, Techniques, and Procedures (TTP). Identifying employment of Camouflage, Concealment, and Deception (CCD) and identification of emerging research and development. Contributing to the Common Operational Picture (COP) by precisely locating activities and objects, assessing and discerning the significance of activities and events observed on imagery. Analyze aerial imagery to identify personnel, installations, weapons and equipment for algorithmic development. Objective : Service-oriented Imagery Analyst with 4 years background in fast-paced environments. I have experience being in a leadership role through the Army by being put in multiple leadership positions during my 4 years of active duty. I currently work as a contractor for the National Geospatial-Intelligence Agency Office of Counterterrorism. Exploiting imagery and providing intelligence products using several different programs. Able to exploit EO, SAR, IR, TIR, OPIR, MSI, HSI and PI imagery. Possessing extensive knowledge and understanding of advanced Geoint production methods and practices. Understanding the EM spectrum and its uses towards determining which bands would best suit specific product creations. Using principles and techniques of photogrammetry and employing the electronic, mechanical, and optical devices to obtain information from imagery. Obtains intelligence by studying and analyzing imagery products. Understanding the different Sigint collection methods such as Electronic Signals Intelligence (ESMINT), Communications Signals Intelligence and Foreign Instrumentation Signals Intelligence and how to exploit the information as well as an understanding of the technical processes of how the information is collected as well as how to exploit it to answer specific intelligence questions. Integrating the data from intelligence collection, fusion, correlation, and dissemination systems related to UAS-RPA, manned, satellite, and surface/ground, Intelligence surveillance and reconnaissance (ISR) systems. Providing experienced imagery analysis support for FMV, Electro-Optical (EO), Synthetic Aperture Radar (SAR), Infrared (IR) imagery and any future imagery sensors which may be employed in support of AFSOC PED operations. Conducting imagery exploitation and generating Near-Real-Time (NRT) voice and textural reports in accordance with mission reporting requirements. Producing and disseminating the tailored, imagery-based products (e.g. Stills, 360 analytical products, vehicle/personnel follows, video clips) in response to the mission requirements and providing these products to the government. Responsible for validating and releasing the imagery based intelligence products resides with the government/military. Created ARC GIS related products in support of PED operations. Attend and facilitate mission planning and mission briefs as well as post-mission analysis and post-event analysis. Summary : Highly trained Senior Imagery Analyst with over eight years of experience at producing accurate and detailed products under strict time constraints. Core competencies include hard-working, self-motivated, and knowledge of imagery exploitation programs as well as excellent communication and time management skills. Handles tasks with accuracy and efficiency. Exploited and produced u-2, predator and global hawk derived Synthetic Aperture Radar (SAR), Electro-Optical (EO), Multi-Spectral (MSI), And Senior Year Electro-Optical Reconnaissance System (SYERS) missions and created imagery intelligence products as part of the Combat Unit Operating Distributed Ground System-1 (DGS-1), a major element of the AF Distributed Common Ground System (DCGS). Analyzing the predator/warrior alpha Unmanned Aerial Vehicle (UAV) Missions In Support Of Counter-Improvised Explosive Device (IED), Kinetic Post-Strike Full Motion Video (FMV) Analysis, Air Force Special Operations Command (AFSOC) Predator UAV Missions, Operation Iraqi Freedom, And Operation Enduring Freedom. Exploited global Hawk/U2/Syers2 missions and created intelligence products in direct support of combat missions as well as contingencies and exercises. Conducted initial Battle Damage Assessment (BDA) kinetic-strike analysis in Near-Real-Time (NRT) from the global hawk and U2 imagery in support of major combat operations for operation enduring freedom. Exploited Measurement And Signals Intelligence (MASint) missions and MASint products in direct support of the Counter-Ied Mission, Counter-Narcotics, And High-Value Individual (HVI) Targeting/Tracking Operations. Responsible for tracking all products by maintaining Excel spreadsheets to monitor all daily production activity so that it could be passed onto the rest of the team for review and posting onto the web. Exploited quick turn-around, actionable intelligence, in a timely matter for SOF forces to respond appropriately to the environment in the theater. 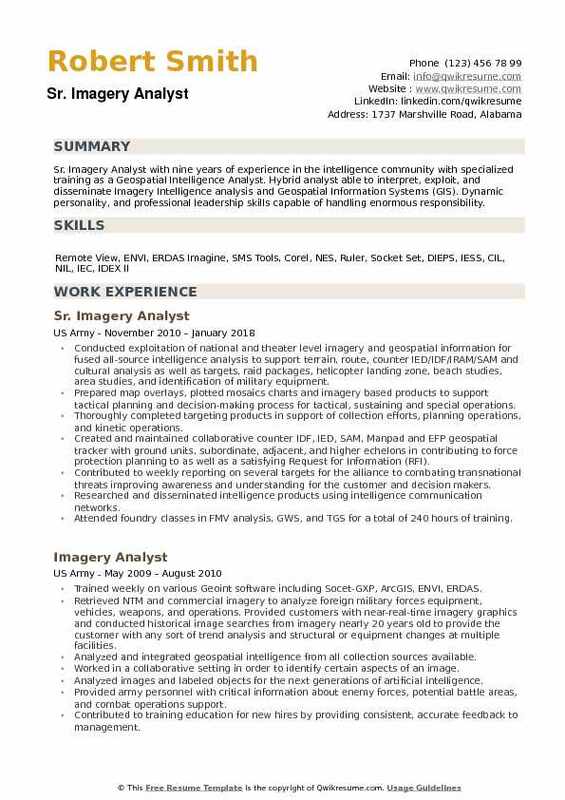 Objective : Seasoned Field Engineer/Imagery Analyst with 4 years of experience. Specialized work experience in imagery analysis at the tactical, operational, and strategic (national) levels, analyzing National Technical Means (NTM) and Commercial satellite electro-optical, infrared, multi-spectral, and synthetic aperture radar imagery. My expertise also includes National Security database research, including infrastructure, countries, geographic areas, and military orders of battle. Obtained and maintained a top secret clearance with sensitive compartmentalized information caveat. Performed exploitation of a wide array of imagery to include electro-optical, infrared, synthetic aperture radar, multi-spectral imagery, hyperspectral imagery, and full motion video. Produced imagery products such as helicopter landing zone, coastal landing beach, raid, compound, and route studies in both combat and garrison environments. Supported all elements of the Marine air-ground task force with actionable intelligence. Provided intelligence update briefs to squadron/battalion commanders with significant activities in combat zones. Prepared intelligence preparation of the battlespace reports for Commanding Officer, Sergeant Major, Executive Officer, Operations Officer And Intelligence Officer. Conducted weekly briefs and updated threat assessments when requested. Proficient in the use of procedures for handling classified material and data on classified networks. Summary : Mission-driven Sr. Imagery Analyst with over ten years of experience and expertise in Imagery intelligence (IMINT), open-source intelligence (OSINT), and moving target indicator analysis (MTI). Integrating software and data sources to collect, report, and disseminate more than 100 Comprehensive intelligence reports and requests for information as well as produce over 300 tactical decision aids. Attended and completed both the army's Moving Target Indicator (MTI) and imagery analysis training program. Working with visible, IR, radar, multi and hyperspectral imagery in an effort to create intelligence reports on real-world missions. Created more than 100 advanced geospatial imagery products. Have exercised my analytical skills in both real-world operations in Iraq and field station Korea. Embedded in a 24/7 fusion watch floor, conducting classified briefings to high ranking officials about current operations. Consistently used imagery analysis in Socet GXP, to produce more than 150 imagery derived products in Iraq. Conducted Counter-IED and route analysis, while utilizing FMV to conduct overwatch on convoys and combat operations to ensure the safety of U.S. Soldiers. 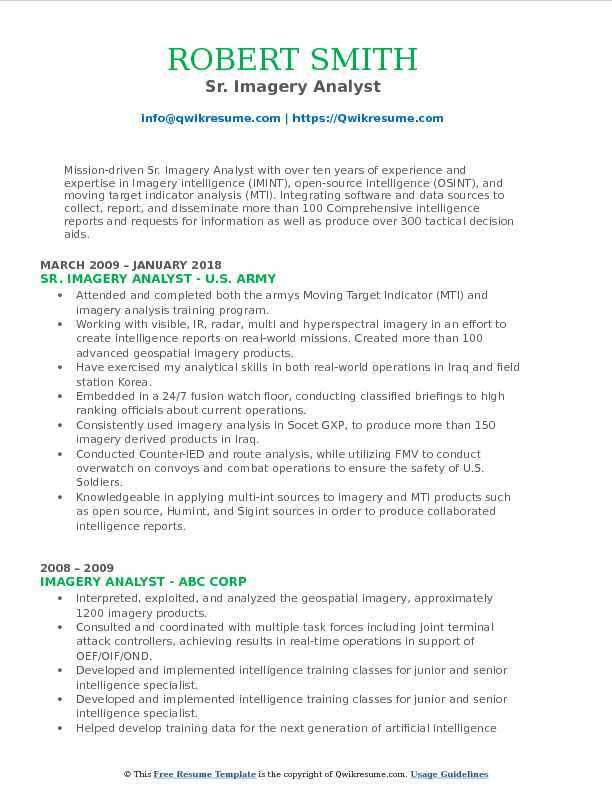 Knowledgeable in applying multi-int sources to imagery and MTI products such as open source, Humint, and Sigint sources in order to produce collaborated intelligence reports. Trained multiple new coming analysts on current standard operating procedures and intelligence techniques. 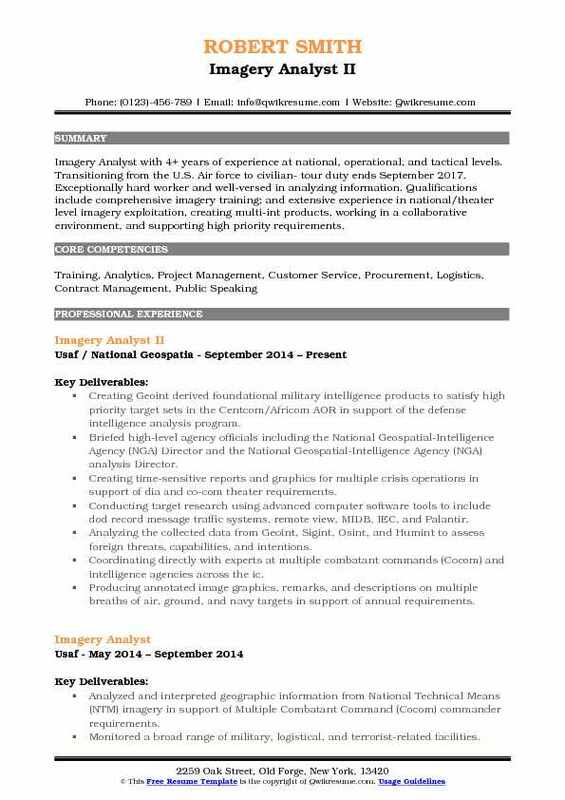 Objective : Imagery Analyst with 4+ years of experience at national, operational, and tactical levels. Transitioning from the U.S. Air force to civilian- tour duty ends September 2017. Exceptionally hard worker and well-versed in analyzing information. Qualifications include comprehensive imagery training; and extensive experience in national/theater level imagery exploitation, creating multi-int products, working in a collaborative environment, and supporting high priority requirements. Creating Geoint derived foundational military intelligence products to satisfy high priority target sets in the Centcom/Africom AOR in support of the defense intelligence analysis program. Briefed high-level agency officials including the National Geospatial-Intelligence Agency (NGA) Director and the National Geospatial-Intelligence Agency (NGA) analysis Director. Creating time-sensitive reports and graphics for multiple crisis operations in support of dia and co-com theater requirements. Conducting target research using advanced computer software tools to include dod record message traffic systems, remote view, MIDB, IEC, and Palantir. Analyzing the collected data from Geoint, Sigint, Osint, and Humint to assess foreign threats, capabilities, and intentions. Coordinating directly with experts at multiple combatant commands (Cocom) and intelligence agencies across the ic. Producing annotated image graphics, remarks, and descriptions on multiple breaths of air, ground, and navy targets in support of annual requirements. 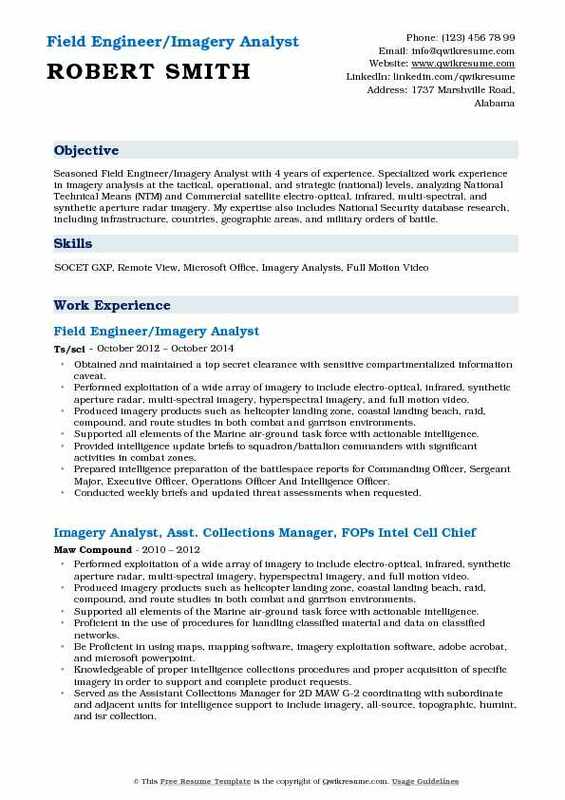 Summary : Accomplished and energetic Imagery Analyst I with a solid history of achievement in Intelligence Analysis. Achievements: Air Force Achievement Medal for dedication to service in Korea. A motivated leader with strong organizational and prioritization abilities. Skills : Microsoft Office, Microsoft Word, Outlook, Microsoft Excel, SOCET, RemoteView, Google Earth. Answering daily questions about current intelligence problems in the Pacific theatre with Imagery Analysis. Adhering to NGA writing and graphics standards for both short and long intelligence reports, complete with accurate source citations. Working within Microsoft Word and Powerpoint templates for various report types in order to gather all pertinent data on target themes. Mensurating the order of battle features on imagery to discover key id feature and gather data for long-term analysis projects. Analyzing the patterns of activity on imagery in order to provide more detailed justifications for imagery collection requirements. Creating basic map graphics using ArcMap to illustrate strategic themes on a broader scale. Became an instructor for a week-long GIS 2101 course hosted by the NGA college. Coordinating and collaborating with other Analysts across the intelligence community to produce joint intelligence products. Summary : Sr. Imagery Analyst with nine years of experience in the intelligence community with specialized training as a Geospatial Intelligence Analyst. 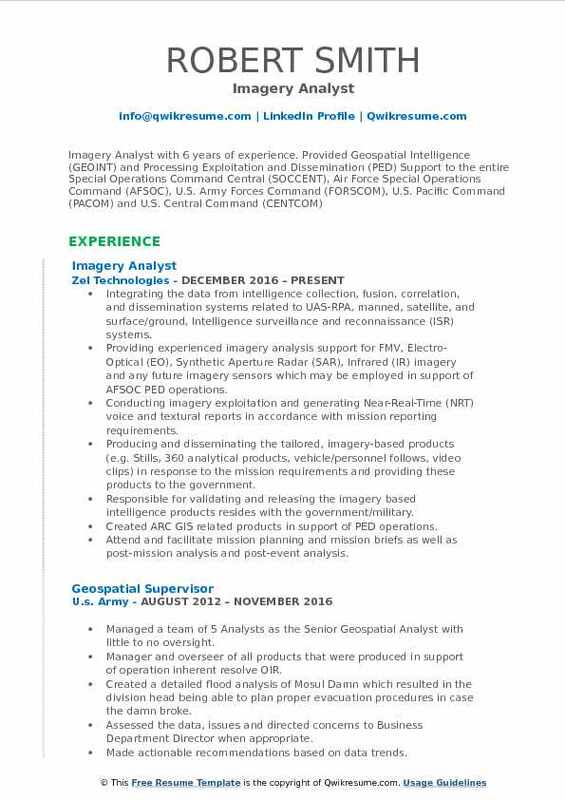 Hybrid analyst able to interpret, exploit, and disseminate Imagery Intelligence analysis and Geospatial Information Systems (GIS). Dynamic personality, and professional leadership skills capable of handling enormous responsibility. Conducted exploitation of national and theater level imagery and geospatial information for fused all-source intelligence analysis to support terrain, route, counter IED/IDF/IRAM/SAM and cultural analysis as well as targets, raid packages, helicopter landing zone, beach studies, area studies, and identification of military equipment. Prepared map overlays, plotted mosaics charts and imagery based products to support tactical planning and decision-making process for tactical, sustaining and special operations. Thoroughly completed targeting products in support of collection efforts, planning operations, and kinetic operations. Created and maintained collaborative counter IDF, IED, SAM, Manpad and EFP geospatial tracker with ground units, subordinate, adjacent, and higher echelons in contributing to force protection planning to as well as a satisfying Request for Information (RFI). Contributed to weekly reporting on several targets for the alliance to combating transnational threats improving awareness and understanding for the customer and decision makers. Researched and disseminated intelligence products using intelligence communication networks. Attended foundry classes in FMV analysis, GWS, and TGS for a total of 240 hours of training.